I am a woman of my principles. Until I’ve worn the same sweater three days in one week and I have no other options to cover my bulging tummy and I feel like I’m going to go mad if I have to keep wearing the same clothes over and over and over again. Then, I'm a woman perturbed. So last Friday, I was getting dressed, and almost everything I put on would not stay down over my exposed whale flesh. And lo, that is not a cute look. And that’s how I found myself standing in a Motherhood Maternity store approximately two hours later. I went in armed with a healthy dose of skepticism modified with dollop of desperation. And while I did have to endure a kind but wacky saleswoman (“I really think professional football is horrible, don’t you? I mean, did you see the pictures of Brett Favre’s leg this week? I hurt my ankle one time and it looked just like that, all black and green and blue, the bruise went all the way to my hip. And to think the players from the other team kept going after him. I mean, they could have killed him. Really. Criminal charges should be filed.”), I left an hour later with a bag full of new shirts that both cover the whale flesh comfortably and look cute without costing a ton. 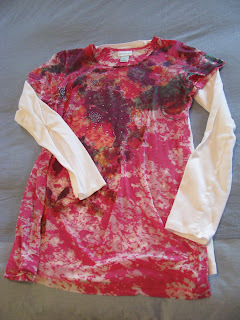 I got a couple of long-sleeved t-shirts (one white, one pink) for $9.99 each. I replaced my white maternity layering tank that I can’t find for the life of me for only $12.99. And I got these two kicky shirts, which made me very happy. End result? I almost doubled my winter wardrobe (and since that pink t-shirt is technically short-sleeved, I added to my spring/summer maternity box as well) for about $80. Lucky for me, I don’t plan to return any of it. Humble pie isn’t so bitter with a side of cute clothes. LOVE the last tee! I might have to run up to the MM store and get me one of those! :o) I'm feeling the same way, but I've still got a bin of hand-me-overs from a neighbor that I need to go through. Can't justify spending money when there might be perfectly cute clothes in the garage. I'm a huge fan of Motherhood Maternity! You can find great deals and look cute! And you look great!! Now, see! I was sitting in Bible Study yesterday, looking at your cute self and (knowing that you weren't going to buy any maternity clothes this time around) thinking, "Wow! She was super ahead of the fashion curve when she was pregnant with Teyla." And now I know ;). But it was totally worth it. 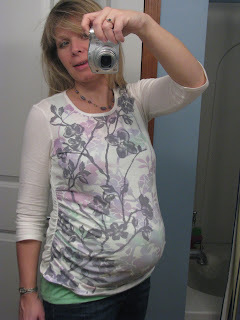 You looked aDORable, and most days preggo mamas need just that. SO CUTE. So are the clothes! So cute! There's nothing like cute maternity clothes to help you feel better. Cute shirts! I have only purchased a few things this pregnancy, since I have so many clothes from five previous ones. One thing I did get this time was a Bella Band. I wear it to keep my maternity jeans up (and it let me wear my regular jeans up to 24 weeks! ), and it keeps my belly covered too, should I have any creeping up issues. So cute! Love the shirts. It's nice to have clothes that fit. Word of caution, though: Do not put the shirts in the dryer. I have the worst luck with MM stuff shrinking. Didn't you check out Target? Our Target's maternity clothes have been so incredibly cute lately it ALMOST makes me wanna....nah.